As our weak on border security government tries to ram yet another amnesty down our throat the American public is pushing back. Being an American citizen has traditionally carried a lot of weight in the world and as such has been a very valuable thing to possess. The value of a US citizenship has naturally been very high since the founding of this country. But like everything of value the effect of supply and demand controls the market.Traditionally it has taken years to complete the process necessary to acquire a citizenship. The road to being an American is paved with lots of hurdles. Included is language requirements and American history tests very few people born here could pass. That has never stopped the ambitious people of the world from lining up to pay their dues towards something as priceless as being an American. It was not easy to achieve the dream of citizenship and anyone wanting to fulfill that dream had to earn the privilege of being an American. There in lies the problem with yet another amnesty plan. By giving away citizenships for free to any and all that stick their greedy little hands of perceived entitlement out it only cheapens the value of the citizenship of every legally earned or born US citizen here in this great country. As an example lets view a US citizenship as a bar of gold. That bar of gold is of great value and is coveted by much of the world driving its value up. Then the government decides to give bars of gold away to anyone that wants one and Mexicans over run the fences and stick their hands out like a soup line full of beggars. Once here they get a free bar of gold just for asking/demanding. If anyone can get a bar of gold just like yours for free, what happens to the value of your bar of gold? The answer is it has no value. Its worth as a rare metal is gone once it is traded on the open market with less regard than a 10 cent returnable soda can. That is exactly what has happened to our worth as a citizen of this once proud country. Starting with the first amnesty granted by Regan and continued repeatedly by several presidents from both parties since. Not only is our status as an American being devalued but the lifestyle we enjoy is being taken away by those demanding we give them our riches but that we also convert our country to resemble the country of their origin in their refusal to acclimate into the American culture. Not only do we have to give away the store, we have to convert it over to better reflect the squalor of a third world country first. Washington has to stop throwing away our most precious possession like a paperboy throwing papers across the yards on a Sunday morning. 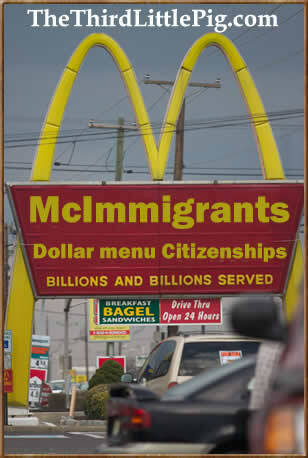 Citizenships now have less value then a prepaid cell phone at 7-11 and is easier to set up. Why should the people of America be proud to be an American when by virtue of the give away programs there is nothing unique or special in being an American! If US citizenships were being traded on Wallstreet they would be considered no better than junk bonds.